Turn asparagus into a favorite side dish with this roasted asparagus recipe. This healthy side dish is easy and can be made ahead. Marinade it in olive oil, balsamic vinegar, and spices, top with cheese, then roast it in the oven at 400 degrees. Enjoy a second helping of this low carb side at Easter or a spring dinner party. This post was originally published on December 21, 2017. This roasted asparagus recipe is the perfect make ahead side dish for Easter and spring entertaining. Since the delicious homemade marinade comes together in a few minutes, you can have this healthy side dish all prepped hours, or up to a day in advance. Just before you want to serve it, pop it into the oven so the asparagus can roast. Get asparagus with firm stems with tightly closed, compact tips. Make sure they have a bright green in color with fresh ends. Avoid ones with drooping tips and limp, wrinkled stalks. Trim a little off of the ends. Stand up the stems in a container of 1 to 2 inches of water. The tips go bad when they turn a very dark green. The tips are also very soft, almost mushy to the touch. Raw asparagus that has gone bad can have an off smell. Rinse with tips down under cold water to get the dirt off. Chop or snap off the woody part of the stalk. Optional: peel off the woody part with a vegetable peeler. The bottom part of the stalk will be more tender. You’ll throw out less than if you just cut off the woody part. Rinse the stems under cold water with the tips down. Trim a little off of the end of the stem to get a fresh cut. If it’s thin, lay the asparagus flat. If fat, hold in your hand. Use a vegetable peeler to remove the woody part which is typically the last two inches. Peeling exposes the lighter green/white part of the stem, and makes it edible. Raw: peel off the woody part and toss in a vinaigrette. Sautéed: in butter for 3 to 5 minutes. Roasted: tossed in olive oil, roast for 15 to 20 minutes at 400 F.
Steamed: over boiling water in a steamer basket for 4 to 5 minutes until crisp/tender. Blanched: cook in boiling water for 2 minutes, submerge in ice water. Grilled: toss in olive oil, grill for 3 to 5 minutes on a grilling pan. What can I make with asparagus? How do you freeze asparagus? Trim the woody ends off. Blanch in boiling water for 2 minutes. Chill in a bowl of ice water. Freeze in an airtight container or zip-top freezer bag. Keep frozen for up to 12 months. How do you make roasted asparagus? Gather all the ingredients. Rinse and trim off the ends of the asparagus, then grate the Asiago and Romano cheese. Measure out the spices and the liquids (white wine, white balsamic vinegar, and olive oil). Arrange the asparagus so the tips face in the same direction on the foil-lined cookie sheet. If you want them more spread out, put the asparagus on two cookie sheets. Start the marinade by putting all the dried spices in a mortar. Grind up the spices with the pestle to release some of the oils and change the texture. To finish making the marinade, put the spices in a bowl and add the white wine, white balsamic vinegar, and the olive oil. Whisk until combined. Drizzle the marinade over the asparagus, making sure it covers the tips and the stems. Flip each piece over so it’s well coated, then cover lightly with plastic wrap and refrigerate for 1 to 3 hours, or overnight. This will allow the asparagus time to soak up the flavors from the marinade. Preheat the oven to 400F. While the oven is heating, flip the asparagus one last time to distribute the marinade. Roast in the oven for 10 minutes. Take it out of the oven and sprinkle on the Asiago and Romano cheese. Place back in the oven and continue roasting for 5 to 10 minutes or until the cheese is melted and the asparagus is lightly browned. You can also choose to melt the cheese under the broiler. If you’re doing it this way, watch closely; it should be done in 4 to 5 minutes. While it is still warm, squeeze on some lemon juice. Serve when it’s still warm. Roasted asparagus tastes wonderful when served with baked ham, salmon, grilled chicken, lamb, or pan seared tuna steaks. Want a different cheese? Try Parmesan, Fontina, Gruyère, or mozzarella. Short on time? Marinade for an hour instead of three. Don’t over crowd. A shallow layer of asparagus will roast better, so use a second baking tray, if necessary. Want it cheesy? Add the grated cheese halfway through roasting. No foil? Oil the pan before roasting. Want extra zing? Add lemon juice, lemon zest, or a splash of white balsamic vinegar just before serving. Want a different spice? Try using fresh thyme just before serving. Use spears that are the same thickness for ease of roasting. Our whole family absolutely adores the taste of asparagus cooked this way! Busy Baker feels special holidays, like Easter and Christmas, wouldn’t be complete unless our roasted asparagus is on the menu. Try it this spring for your holiday entertaining. Love roasted vegetables? Why not try these other amazing side dishes. 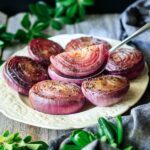 Make Ahead Marinated Red Onions: a tasty, healthy side dish that’s perfect for an elegant dinner. Balsamic Roasted Carrots: an easy side that everyone will love at Easter. 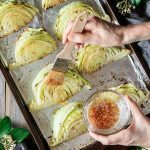 Roasted Cabbage Wedges with Lemon Garlic Butter: a quick vegetarian side that’s buttery and flavorful. The pleasure of a 5-star review for this roasted asparagus recipe would be greatly appreciated. Line one or two large cookie sheets with aluminum foil. Rinse the asparagus with tips down, and cut off or peel the tough ends (roughly two inches). Arrange the asparagus in a neat row on the prepared cookie sheet(s). Put all the dried spices in a mortar and use a pestle to grind them smaller, especially the rosemary. Pour the spices into a medium bowl, add the other ingredients, and whisk until well combined. Drizzle the marinade over the asparagus, then flip each spear over so it is well coated in the marinade. Refrigerate for 1-3 hours. You can also marinate overnight. Preheat the oven to 400 F. Flip each piece over to evenly distribute the marinade. Cook for 10 minutes, then take out the tray and sprinkle with the grated cheeses. Cook for another 5-10 minutes, until the cheese has melted and the asparagus is lightly browned. Drizzle freshly squeezed lemon juice over the top and serve immediately. The pleasure of a 5 star review of this recipe would be greatly appreciated.